Samsung has started rolling out a new update for the Galaxy S6 and S6 Edge that brings several stability and performance improvements as well as new features. 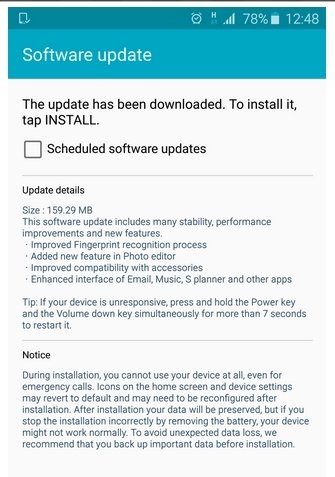 Weighing in at around 159MB, the update (build number XXU1AOE3) includes improved Fingerprint recognition process, a new unspecified feature in Photo editor, enhanced interface of some of Samsung's own apps, as well as improved compatibility with accessories. The update, which is currently rolling out for users across Europe and Asia, comes just a week after the devices received another performance improving update aimed at fixing memory issues. Yesterday I get new update from Samsung. Added new note5 icons and fast touchwiz wow... Thanks Samsung. This update decreased my battery life significantly since before the update my battery lasted 36 hours with minimum activity and now lasts only 12 hours with minimum activity.